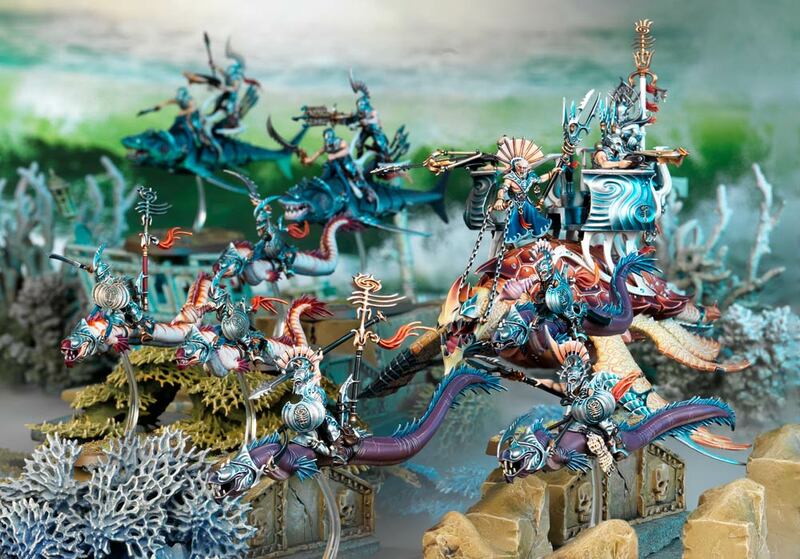 With Warhammer: Age of Sigmar 2.0 on the way, Games Workshop has re-evaluated Command Abilities for their Heroes. Get ready for your Hero Phase to get a lot more interesting in the new edition. The Hero Phase in AoS is typically where your Wizards are firing off spells and your Army General is shouting orders at the troopers near them. For many armies, lots of their Heroes also have these Command Abilities, but they rarely get used because they aren’t the Army’s General. That all is about to change in the next edition. That’s right folks, Command Points are coming to AoS but not quite in the way we thought – And that’s a good thing! You’ll need to spend these Command Points to trigger Hero Abilities and this new resource will be limited. At the same time you’ll generate them as the game goes on as well. I like it! 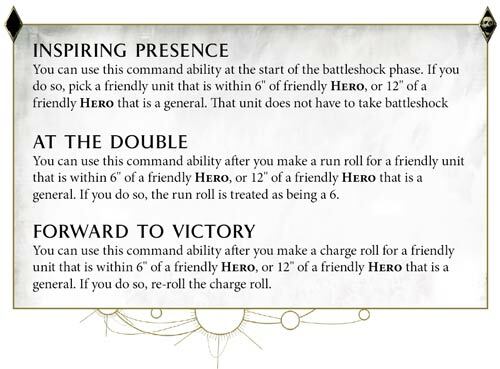 When GW announced that Command Points were coming to AoS, I was very concerned about them taking away some of the tactical choices in the game by allowing players to essentially undo bad dice rolls/mistakes in play. For example in 40k, Command Points feel more like a safety net than a tactical choice. We’ve all had times where you (or your opponent) were able to mitigate mistakes by tossing Command Points at the problem. This new system sounds like it’s going to give players more access to those Command Abilities and give them options – at the same time it’s doesn’t sound like CPs are going to flow as freely as they do in 40k. A lot of the Command Abilities also have a ranged component to them as well meaning your Heroes will have to be in range of the unit to use their Commands on them. That’s another tactical choice that differentiates the two systems. Inspiring Presence is getting a tweak and all players are getting access to two more “generic” abilities, too. But these all are good examples of how those Command Abilities will be accessible but limited at the same time. Note they all require a Hero to be in range of a unit. That means that positioning becomes more important to the game. You might have the perfect Command Ability for the situation at hand, but if you’re out of position, you’re out of luck. The more I think about this system, the more I like it. Imagine if your games of 40k required a character to be within 6″ of a unit to use a Stratagem on them – that makes the game a lot deeper. That’s basically what’s going on here with Age of Sigmar. Players will have access to a TON of abilities through their Heroes, but they will have to manage their Command Points and positioning to use them. 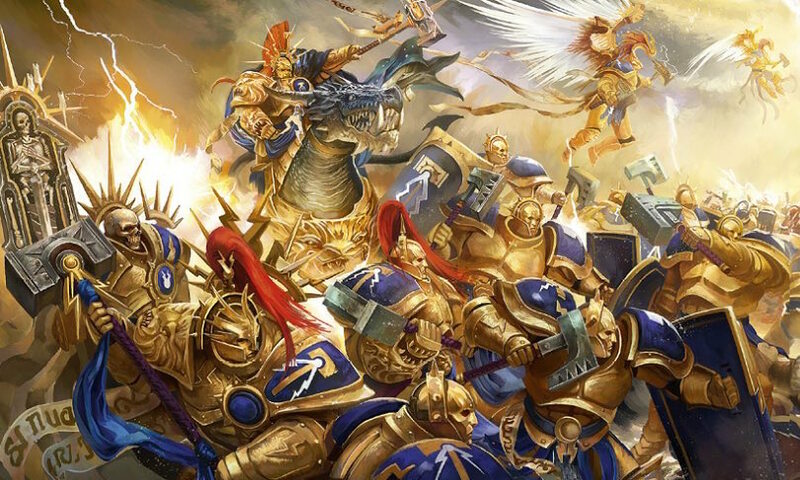 What do you think of the new Command Points and Command Ability changes coming to Age of Sigmar? Would you want similar restrictions in 40k?